LessThanPi Art: Emma Comic Contest Entry! 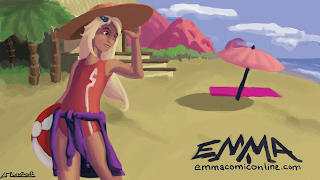 This is actually an entry for the first contest for the Emma Comic! I'm not very proud of it but instead of working on it this week I've been playing scrolls so I can only really blame myself for not putting enough time in. I actually was going to include Niko and "the pup" but do to time constraints I decided to leave them out of this one. I plan on doing the 11th episode of the LessThanPi Show on this piece, so check back in a few days on that. Alright and with that I've gotta run to work. As always be safe, God bless, see you next time!